The Value of Giving Thanks – Thanks for Godly Mentors! I just read about the value of giving thanks in a blog by Katya Anderson. She referred to a study that demonstrates the correlation between happiness and giving thanks. If it works for children, I’m sure it works for adults as well! Today I would like to give thanks for the godly mentors the Lord has given me over the years. Two of the most important men in my life apart from my dad, are Dr. Thomas Graham and Dr. William T. Iverson. I will feature Dr. Graham in my next post, so stay tuned. Today I will focus on Dr. Iverson. I met Bill 27 years ago when I entered seminary. It was a time when I was young, and thought I knew much more than I actually did. Bill had a knack of putting us in uncomfortable places, and letting us squirm a little. It was practical theology at it’s best. He used to call it theology with skin on. I have many stories from my time with Bill. One of my fondest memories is from my first semester in seminary. Bill took me down into the city of San Bernardino. It was the seedy part of town. I grew up in the suburbs, so I didn’t feel entirely comfortable in the places we visited. We found ourselves in this run down coffee shop. Bill being the gregarious guy that he was just started talking with different people in the coffee shop. He noticed one of them had a book, so he asked him about it. He was friendly in the way he asked, and he showed interest in those he talked to. He always looked for ways to engage people. I saw Dr. Bill boldly loving these people, and I was astonished. I said to him, “Bill, how are you able to talk to people so easily, I always feel afraid to engage people I don’t know.” He said something I’ll never forget. “Remember these people are scared too, and you have something they don’t have, you have the Holy Spirit.” Then he added, “Just learn to enjoy people.” Wow! what a great lesson. One of the philosophies that I’ve held on to in all my years in ministry is that, ministry flows out of relationships. I learned that in a very real sense in that coffee shop. If you ever get a chance to talk to Bill he’s sure to bring up the part he played in hooking Dawn and me up. And it is true that when I first met Dawn she lived right across the street from Bill, and his wife, Ann. Bill and Ann helped foster our relationship! God has blessed me in having two such godly figures in my life. I hope to write more about each of them in my blog in the future. Both of them are 83 years old. They are both still very involved in ministry. 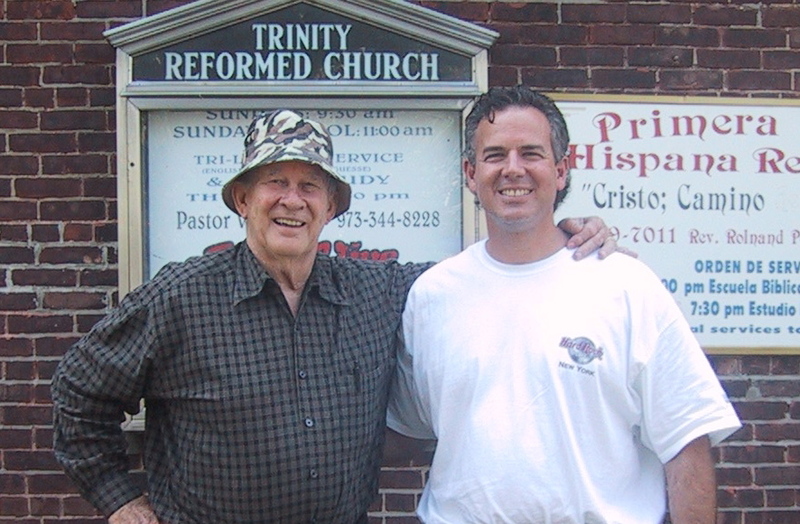 Bill at 83 is planting a church in New Jersey. I think he’s still got more energy than I do! He was just featured in an article in byFaith Magazine. You can check out the article here. We want to follow in his steps! Luv you Dave! The Arrival of Daniel Ezequias – Give Thanks!